Accredited Fellow with the American Academy of Cosmetic Dentistry (AACD)? One of my dentists, Dr. Emil Hawary, recently earned the AACD Accredited Fellow honor. This is a big deal! He is one of only eight dentists in the entire state of California to hold this designation. And at the time of this writing, less than 60 dentists in the world carry this prestigious title. When you look for a dentist for your cosmetic or dental reconstruction work, you want to find the most capable possible. 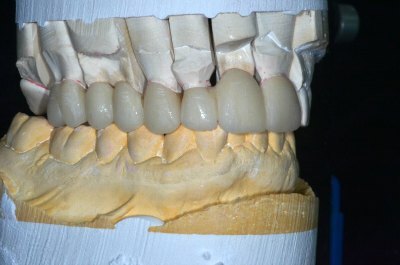 In most instances, this also means your dentist is working with a capable and experienced dental technician. 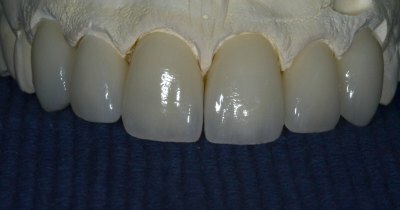 Veneers used to close a gap between teeth. Dr. Hawary was excited and called me as soon as he found out to share the news. He thanked me profusely because I was the aesthetic dental technician who worked on his patients' cases used to pass the examination. Indirectly, this means the The American Academy of Cosmetic Dentistry (AACD) approved and passed my work as a dental technician. More importantly, this really feels good because it means I helped transform and improve the smiles of over 50 patients to the high standards of the Academy. What's it Take to Become an Accredited Fellow? I know a little something about helping dentists reach this designation. 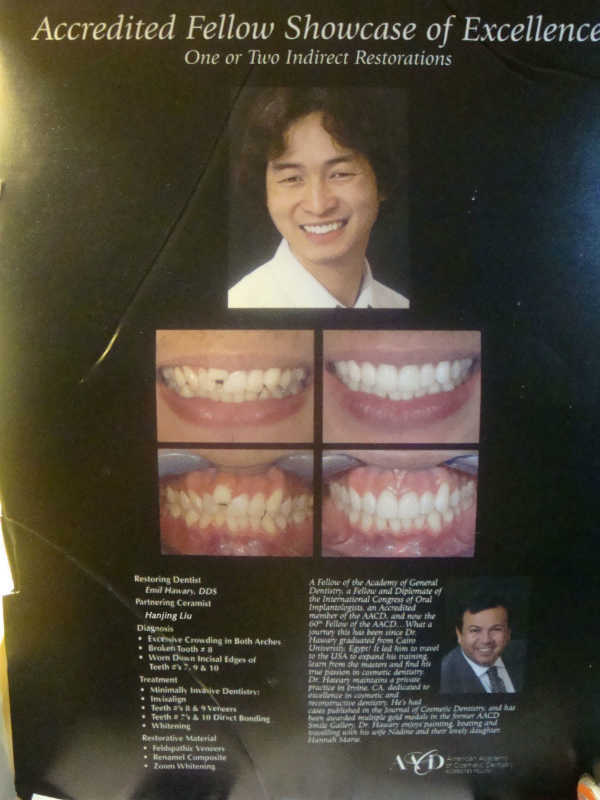 Before Dr. Hawary's news, I apprenticed under a ceramist who was one of a handful of Fellowship dental technicians. This is an even smaller worldwide group than dentists. Side view of seven unit bridge before glazing. What does it take a dentist to reach Fellowship honors? Well, it can be a grueling experience that normally takes a number of years to complete. There are no appeals on any Fellowship cases. The examiners have final say on everything. As you can tell, this is truly a team effort between the dentist and the aesthetic technician. If the technician isn't top-notch, the dentist will have an almost impossible time passing the Academy's standards. There you have it. Now you know why the AACD's Accredited Fellowship honor is one of the toughest in the world, and one of the rarest. Only 60 dentists from around the world have it today. Are you a dentist and interested in securing the AACD's Accredited or Fellowship designation? Why don't you let me help?